Best Travel Agency in Shimla..
Manali is a high-altitude Himalayan resort town in India’s northern Himachal Pradesh state. Manali is situated at an altitude of more than 2000 m from where the eyes fall on the views of forests, orchards, river, mountains ranges and more, for nothing but sheer visual delight. it’s a gateway for skiing in the Solang Valley and trekking in Parvati Valley. 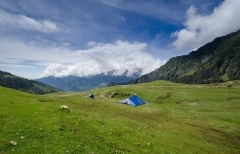 Manali is located at northern end of Kullu valley. Manali, with its soft backdrop background of the Himalayas, provides a blend of peace and adventure that will making it one of the most popular North Indian honeymoon tour destination. Make a Delicious and happy tour with family, Holidaytravel.co stands to make your holiday trip with great and memorable tours. Visit One of The Honeymoon Destination of India-Manali. All Sightseeing and Major Attractions of Manali like, Hadimba temple, Manu temple and Vashisht Village. All other major sightseeing like Van Vihar, Tibetan Monastery, Solang valley and Rohtang pass. Lunch not include in this package. Airfare is not included because it may be changed at Actual time of booking. Any expenses of a personal nature like laundry, telephone calls, beverages, gratuities etc.. Entrance Fees and Camera fees at monuments and other places of interest. Manali – Khushboo Resort - TA Rank - 3. - Certificate of Excellence. Chandigarh – City Height - TA Rank - 3. - Certificate of Excellence. Start the tour from Mumbai and proceed to Chandigarh Via Flight( Spice Jet). Tour Start From Morning 6:00 AM and reach Chandigarh At 12:10 Am. After Reaching Chandigarh Our representative will pick you From Chandigarh Airport and proceed to Manali. It is arround 310 km and take 7-8 hours to complete journey. The journey is too long so we will break journey at Mandi. Have lunch and some rest there, proceed to Manali. After arrival check into hotel and overnight stay. After breakfast visit some local sightseeing of Manali like Hadimba Devi temple, Rahalla Falls, Monastries , Gompa, Vashisht Temple. In Between your visit have lunch at casa Bella Vista and some rest there. After that came back to hotel and overnight stay at hotel. Hadimba Devi Temple: Manali has many attractions but the main centre of interest, historically and archeologically, is undoubtedly the Hadimba Temple . This temple dedicated to goddess Hadimba or Hadimba Devi with a finely wrought four - tiered pagoda roof, dating back to 1553, is built around a natural cave, which enshrines the footprints of the goddess Hadimba. Hadimba was the wife of Bhima, one of the five great Pandava brothers of the Mahabharata, and later became the patron goddess of the Kullu. This four story wooden temple is located in the middle of a forest called the Dhungiri Van Vihar. Monastries: Manali also houses three Tibetan monasteries, that have been built recently. There are three recently built Tibetan monasteries at Manali. The Tibetans living around these Monasteries in Manali offer a vide range of Tibetan Handicrafts and Carpets to the visitors to buy. Two of these Monasteries are located in the main down-town of Manali and one Monastery in Aleo. Aleo is located on the Left Bank of River Beas in Manali. After breakfast visit Solang Valley and Rohtang Pass. Solang and Rohtang Pass are the Major attractions of Manali. In Between your visit have lunch at Casa Bella Resturant, Rest of the day is for your leisure. After that came back to hotel and overnight stay at hotel. Solang Valley: Solang Valley in Manali is located at a distance of 13 kms in a side valley at the top of the Kullu valley is a splendid valley between Solang village and Beas Kund. Solang valley offers the view of glaciers and snow capped mountains and peaks. Solang Valley has fine ski slopes. The Mountaineering Institute of Manali has installed a ski lift for training purpose. Located here is a hut and guest house of the Mountaineering and Allied sports Institute, Manali. Now a few hotels have also come up. The winter skiing festival is organised in Solang Valley. Sking and Paragliding are two main activities are organised here. Apart from this many other adventure sports are available like Zorbing, Horse riding & Snow Motor Bikes riding etc. Rohtang Pass: Rohtang Pass is 51 kms from Manali. Located at a height of 3980 Mtrs, on highway to Keylong/Leh. The Pass offers a panorama and spectacular mountain view. once served as a crucial trade route, and still remains the gateway to the districts of Lahaul and Spiti.The Pass is open from mid April to November each year, and provides wonderful views of the entire surroundings. Just beyond the Pass is the Sonapani Glacier and the twin peak of Gaypan. The Beas Kund, the source of the Beas river, a holy site for Hindus, as the sage Vyas is said to have meditated at this spot, is also accessible from the Rohtang Pass. After breakfast check out from hotel and proceed to Chandigarh. It is around 310 km and take 7-8 hours to complete journey. The journey is too long so we will break journey at Sundernagar. Have lunch and some rest there, proced to Chandigarh. After arrival check into hotel and overnight stay at hotel. After breakfast visit some local sightseeing of Chandigarh like Rose garden, Rock garden, Sukhna lake,Pinjore Garden. After that check into hotel and overnight stay at hotel. Rock Garden: The name refers to a sculpture garden located near Sukhna Lake. The Rock garden is also known by the name Nek Chand’s Rock Garden after its founder. Nek Chand was a former government official who started cultivating this garden secretly in his spare time. Rose Garden: The Zakir Hussain Rose Garden is the largest botanical garden in Asia that is dedicated to roses. The garden is named after Zakir Hussain the former President of India. Apart from roses the garden also features several verities of medicinal herbs. After breakfast check out from hotel and then proceed to Chandigarh Airport/Railway station. Our representative will drop you at Chnadigarh Airport/Railway Station and next journey from Chandigarh to Mumbai via Indigo flight at 12:10 PM and reach Mumbai at 14:35 PM. Vasisht Temple: Vashist, a small village 3 kms from Manali located on the Left Bank of River Beas in Manali towards Rohtang pass is worth a visit, which is renowned for its Hot Water Springs and Temple. The village is also the site of some old temples, dedicated to the great sage Vashisht, and to Lord Rama. The Himachal Tourism sulphur baths are just beyond these shrines. Natural Hot Sulphur Water Springs with two separate bathing tanks for Gents and Ladies, which are always full of tourists. Turkish Style Showers fitted baths have also been built nearby. Hot water from the nearby Spring is provided for bathing. Jagatsukh Temple: The one time capital of Kullu. Here are old temples dedicated to Lord Shiva and to Sandhya Gayatri. The Arjun caves are just ahead. Rahalla Falls: It is 51 kms from Manali. Located at a height of 3980 m, the Pass once served as a crucial trade route, and still remains the gateway to the districts of Lahaul and Spiti.The Pass is open from June to November each year, and provides wonderful views of the entire surroundings. Just beyond the Pass is the Sonapani Glacier and the twin peak of Gaypan. The Beas Kund, the source of the Beas river, a holy site for Hindus, as the sage Vyas is said to have meditated at this spot, is also accessible from the Rohtang Pass. Pinjore Garden: The Pinjore gardens were created by a Nawab under the Mughal emperor Aurangzeb. The garden was expanded and reconstructed by the Maharaja Yadavindra of the State of Patiala. The garden houses several palatial structures that display a distinct blend of the Rajasthani and Mughal styles of architecture. Sukhna Lake: Sukhna Lake in Chandigarh, India, is a reservoir at the foothills of the Himalayas, the Shivalik hills. This 3 km² rainfed lake was created in 1958 by damming the Sukhna Choe, a seasonal stream coming down from the Shivalik Hills.